Meanwhile in France... Firem have been testing out their retrofit chairlift skibike carrier for compatibility with the ever popular SnowScoot. They manufacture a hook/clamp combination which easily mounts to the chassis of a chairlift, I saw and rode the prototype in action during the 2011-12 season at Grand Bornand in France see here. 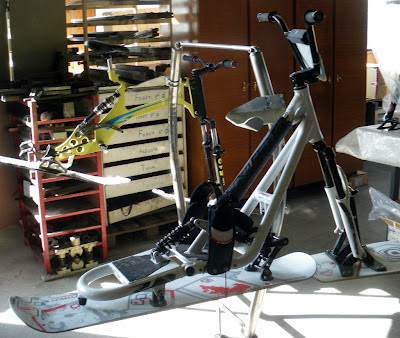 On the prototype system, the lift operators did the hard work of loading and unloading skibikes. At the time, there were only 3 brackets on the chain of 100 or so chairs. As a skibiker you had to wait to one side, then get quickly into place as the special chairs came round. The prototype chairlift ran up to some easy green and blue runs and provided a very safe environment for novices to learn Freestyle SkiBiking (myself included). Once they had gained in experience and confidence, they were able to move to more demanding terrain. From what I gathered at the time, Grand Bornand were aiming to expand into Downhill Mountain Biking uplift for the summer season and making chairlift brackets a permanent feature. Other resorts nearby, have hooks on the back of the chairlift frame to mount your MTB on the chairlift in front of you. Typically they take these off in the winter season to avoid risking clumsy skiers impaling themselves on them. The beauty of the Firem system is that the skibike stays to the side of the chairlift and doesn't interfere with other snow users, nor does the lift need to slow down for loading. If Firem are testing them now, it bodes well, at least for the Alps in the 2013 season and potentially as research data for elsewhere.